I have never eaten this before I hit 24 years old. One day, my ex colleague and I decided to buy lunch from a "lunch van" that stops by and sells lunch to our factory workers. The mobile food stall was operated by a Malay uncle and I happen to see this cute U shaped thing that looks mouth watering. I put some of that into my food box, paid money and went back to my desk and can't wait to taste this U shaped veggie. To my surprise I like it a lot! I didn't know what it was until I looked carefully at the skin and realised it's snake gourd. 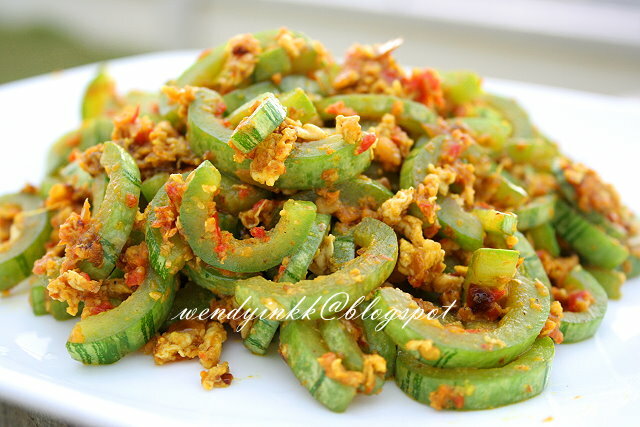 Hmm, never knew snake gourd can be this delicious. That time I was still staying with my buddies in USJ Court 7 and they were surprised when I cooked this for them. 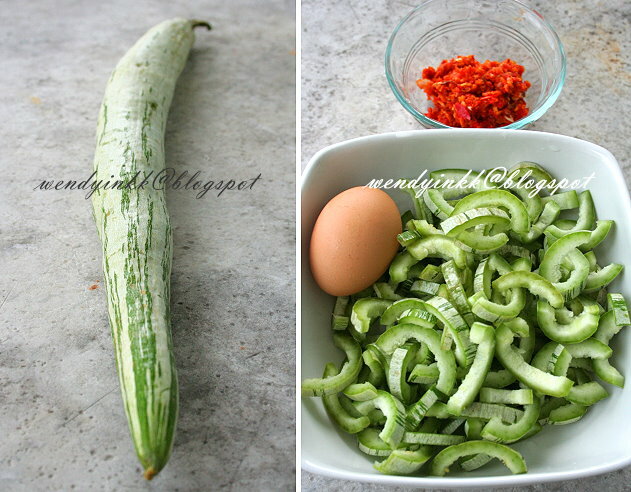 It was something new for everyone, because this snake gourd is not a familiar sight in Chinese cuisine. Don't worry, this gourd isn't slithery, neither does it move. It doesn't live up to its name, LOL. 1. Wash snake gourd. Half the gourd and scoop seeds out with spoon. Slice the gourd about 4-5mm thick. 2. Mill shallots, garlic, turmeric and chilli together. 3. In a wok, put in oil. On medium heat, sauté the chilli paste until dry and fragrant. 4. 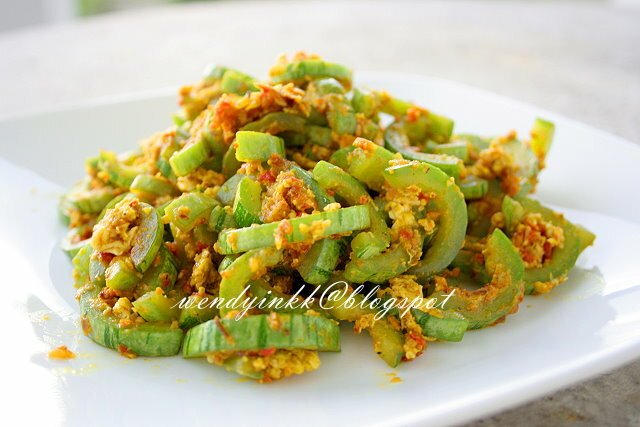 Put in salt and snake gourd slices and toss them around to cook for about 1 minute. 5. Push the gourd slices to the side and crack the egg to the center. Spread the egg a bit and push the gourd slices back in. Scramble the egg and gourd together. 6. Put in ¼ cup water and let it cook until the water is no longer visible. 7. Taste it, adjust if necessary and then dish up. There is one stall in Wooley afternoon session, selling south indian curry and this dish is always available.. i like to order this.. nice! I seen this snake gourd in the wet market but as I have not eaten this before so never buy it. Looking at your post today, I should give it a try. Don't need to peel the skin off and just wash and chop/slice thinly would do? But here in KK no one sells this at mamak stalls. Geram leh. Yes, no need to peel, wash, remove seeds and slice. You can fry with sambal belacan if you want, but I like this method, the egg gives it some uumph! Looks interesting, I've never had it before. I shall keep a lookout for it next time! It looks delicious! I might have eaten this before at Indian curry shop but I can't remember for sure. Must look for this snake gourd on my next shopping trip. Haha, me and Claire love this snake gourd. We used to eat at the Wooley's South Indian curry stall.. nice! Okay, now I know how to cook this :) Thanks for sharing. This gourd can get from the indian veggie stall ? Ooh love spicy....looks very appetizing! The 'uncle' at Little India makes a watery curry out of it which I dislike. This dry version appeals to me much better. Thanks! Is snake gourd the same as luffa? I'm sure ur adventurous tastebuds must have eaten this before, hehehe. Normally Chinese dun eat this, but you can break the norm! Oh, here, most Indian uncles cook it this way. Their names in Malay is similar, one is petola, one is petola ular. But you can compare the looks, I have posted both, they definitely do not look the same. My first glance at this plate of dish I thought is bitter gourd I have seen this selling in the hypermarket at my place. Never thought of cooking it but now looking at yours I want to give it a try. Now you give me the courage to try this, I have seen it sold at the indian greengrocer stall but never given it a second glance. thanks for the feedback, curry leaves is a good idea!